Seeing Coldplay live has been on my bucket list for a long time. Their music has been a part of my life since their first album, Parachutes. Every single album of theirs corresponds with a significant season in my life. Parachutes, A Rush of Blood to the Head, and X&Y took me through my first two years of university. Viva La Vida or Death and All His Friends was the soundtrack during a time when I was trying to figure out who I was and what I wanted to do with my life. Mylo Xyloto helped me navigate the newlywed life. Ghost Stories helped me through a particularly dark time when I felt disconnected from God and my reason for being. A Head Full of Dreams helped break me out of a rough time, which I wrote about in my previous post. 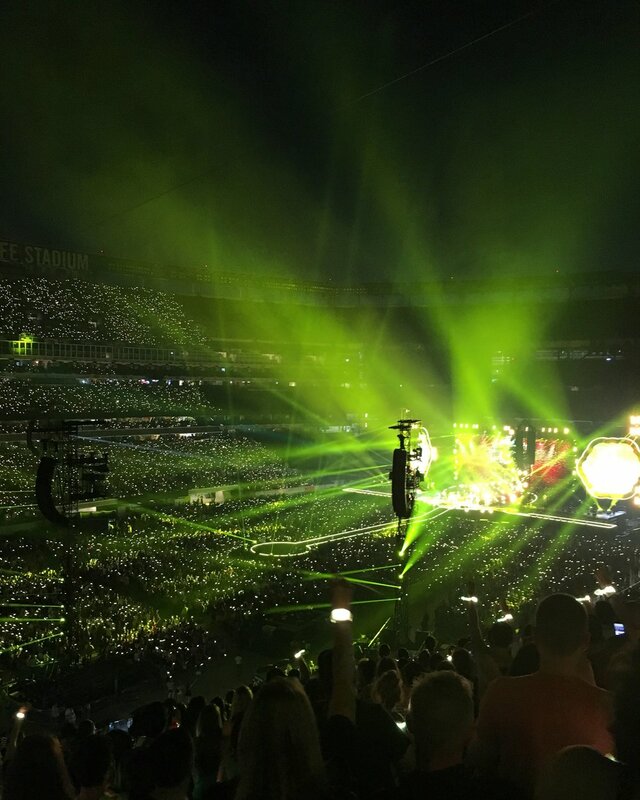 Back in February, one of my best friends texted me saying that she had bought tickets to see Coldplay in NJ in July and I should join her. Honestly, I didn't think twice about buying tickets. Just like that, I had tickets to see one of my all-time favourite bands. My friend (and her friend) ended up being in a different section than me, but I ended up having two seats open in front of me. So they joined me just after the show began. Coldplay was INCREDIBLE. They were everything I expected from them. Chris Martin is so fun and carefree onstage. He was dancing, running, spinning around. If only I could have joined him! I don't know if I've ever danced so much at a show, especially during "Adventure of a Lifetime" and "Hymn for the Weekend." They put on such a great show. It was immersive with the inclusion of Xylobands that synchronized to the music. When they performed "The Scientist," I felt the weight and soul of that song for the first time. And I cried. Goodness, those words sung live cut into the depths of my heart. The same thing happened with "Fix You."
. So the band played "Earth Angel." During the song, Chris said, "Ladies and gentlemen, from the best movie of all time, please welcome Mr. Michael J. Fox!" Cue Michael J. Fox joining Coldplay on stage with an electric guitar. WHAT. That really happened and I was really there to experience it. Michael J. Fox was fantastic! He shredded during "Johnny B Goode." I still can't believe that this happened for realsies! I wish I could truly express in words how freeing, emotive, and beautiful this show was. I cannot wait to see them again!